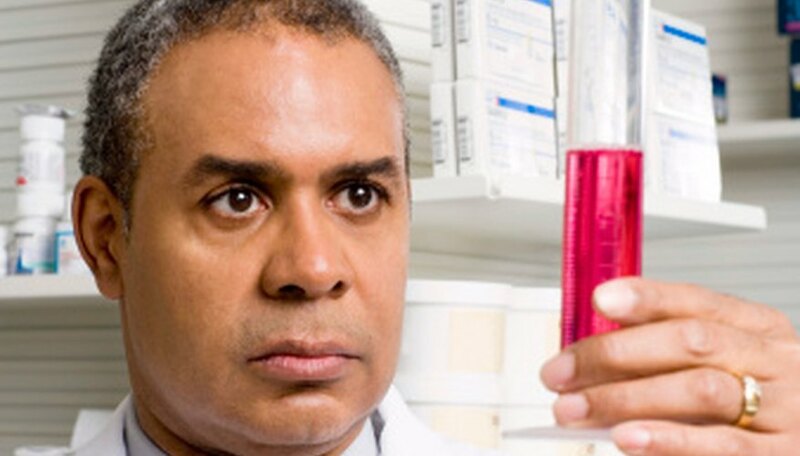 Creating dilutions reduces the concentration of one liquid with the addition of another. In order to create 70 percent isopropyl alcohol, a solution of isopropyl alcohol with a concentration greater than 70 percent must be diluted by a calculated amount of water. The formula for this calculation is C1_V1=C2_V2, where C1 and V1 is the starting concentration and volume of the solution and C2 and V2 is the final concentration and volume of the dilution. For the purpose of this example, the initial solution is 100 percent isopropyl alcohol, creating a final volume of 500 mL of 70 percent isopropyl alcohol. Put on protective goggles and gloves before working with any liquids. Identify the initial concentration of the 100 percent isopropyl alcohol, which is the C1 variable in the equation. The variable C1=100. Determine the desired concentration and volume of the final solution to obtain C2 and V2. In this instance the final concentration C2 is 70 percent and final volume V2 500 mL; So C2=70 and V2=500. Solve the equation C1_V1=C2_V2 for the unknown variable of V2. Substitute known variables: 100_V1=70_500, V1=35000/100, V1= 350. It is determined that 350 mL of 100 percent alcohol is needed for the preparation. Add 350 mL of 100 percent isopropyl alcohol to a 500 mL graduated cylinder. Ensure that the measurement is read at eye level with the meniscus, the bottom of the curved liquid, at 350 mL. 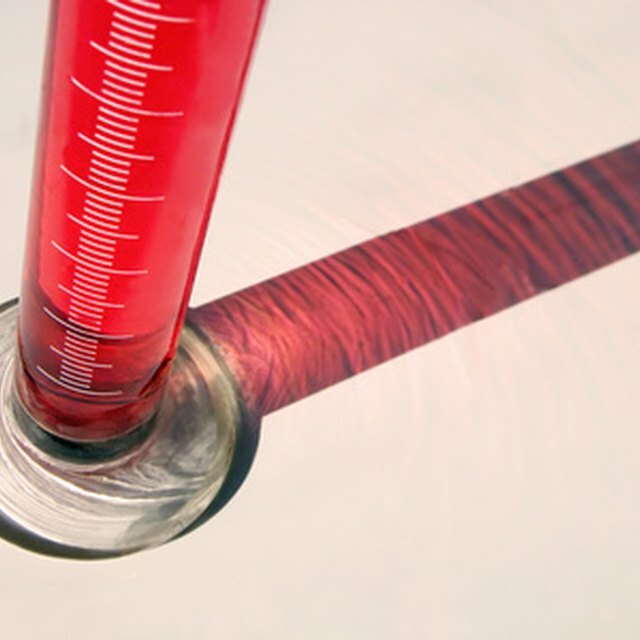 Add an additional 150 mL of water to the graduated cylinder for a total volume of 500 mL, again measured at eye level. Pour remaining solution into a new beaker marked 70 percent isopropyl alcohol and stir with a glass rod. The formula C1_V1=C2_V2 may be applied to any dilution as long as there are at least three known variables, and the initial concentration is higher than the final concentration. Whenever working with hazardous substances, wear proper protective equipment to protect the eyes and skin. Closed footwear should always be worn. Julie Revel, a former neurobiologist in pharmaceuticals, began writing professionally in 2009 with a focus on health and disease prevention. Based in New Jersey, she works as a medical writer in the healthcare industry. Revel graduated from Drew University with a B.A. in neuroscience and is currently pursuing her Doctor of Medical Humanities. Revel, Julie. "How do I Make 70 Percent Isopropyl Alcohol?" Sciencing, https://sciencing.com/how-do-i-make-70-percent-isopropyl-alcohol-12531559.html. 25 October 2017.